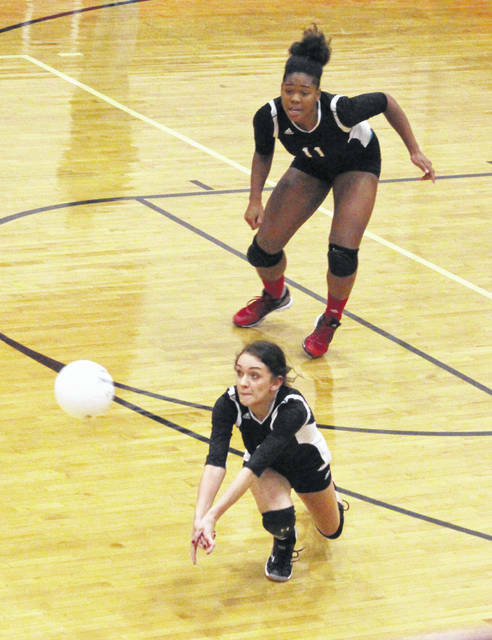 Point Pleasant senior Savanah Wroten dives for a bump attempt in front of classmate Lanea Cochran (11) during Game 1 of Monday night’s non-conference volleyball contest against Teays Valley Christian in Point Pleasant, W.Va.
POINT PLEASANT, W.Va. — A collective triumph. 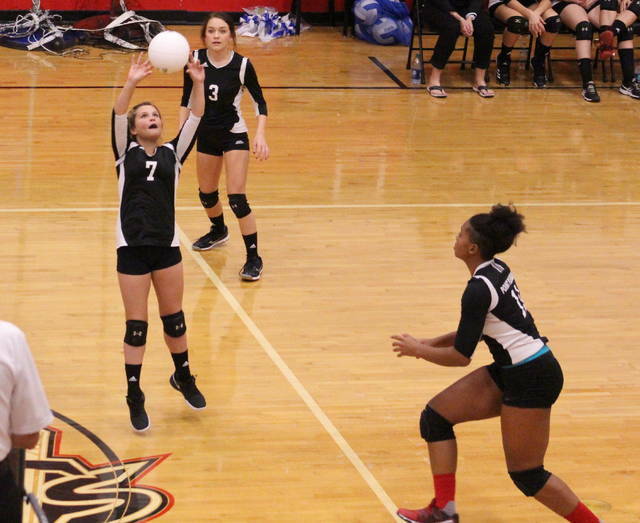 The Point Pleasant volleyball team used all 12 of its players, had seven different people serve up at least one point and another eight recorded at least one kill on Monday night during a 25-10, 25-23 victory over visiting Teays Valley Christian in a non-conference matchup in Mason County. The Lady Knights (23-3) — fresh off their Buffalo Pumpkin Tournament championship from Saturday — rode that momentum into Senior Night festivities as the hosts honored seniors Lanea Cochran, Madison Hatfield and Savanah Wroten for their individual efforts over the years. The Red and Black recorded 25 service points, 10 aces, 17 kills and a block over the course of two games, but the depleted Lady Lions — who were missing four players and two starters — did their best to keep things interesting. The Blue and White jumped out to early leads of 1-0 and 2-1 before finding themselves tied at three-all, but Hatfield came up with eight straight service points during a 9-0 run that resulted in a permanent lead at 12-3. 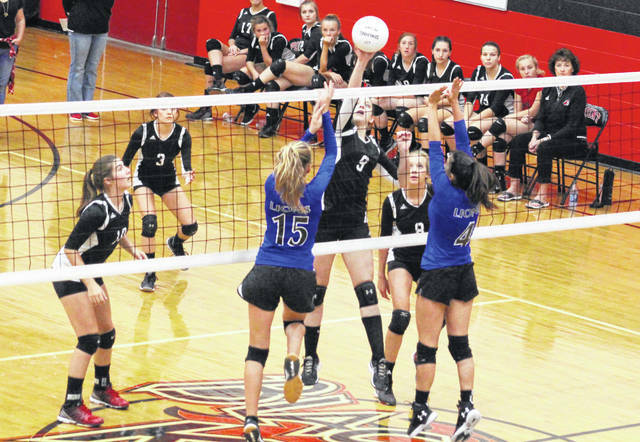 The guests twice closed to within eight points, but PPHS reeled off a dozen of the final 17 points en route to a 15-point win and a 1-0 match lead. There were eight ties and five lead changes in the final game, with Teays Valley Christian twice holding an advantage of five points — the last of which came at 10-5. The Lady Knights broke away from a 20-all tie and claimed their largest lead of two points on four different occasions en route to the minimal two-point win that wrapped up the 2-0 match triumph. Hatfield led the hosts with eight service points, followed by Cochran with five points and Wroten with four points. Nancy Vettese and Olivia Dotson were next with three points apiece, while Peyton Jordan and Olivia Boggess completed things with a point each. Wroten, Cochran and Vettese each recorded three aces, with Hatfield also adding an ace. Cochran led the net attack with five kills and a block, followed by Dotson with three kills. Vettese, Hatfield and Tristan Wilson also had two kills apiece in the win, while Wroten, Boggess and Baylie Rickard each had one kill. Chloe Ferrell paced TVCS with four service points, followed by Chloe Harper and Havyn Jones with two points apiece. Beth Ray also had one service point in the setback. Harper and Adora Campbell also recorded a kill each for the guests.